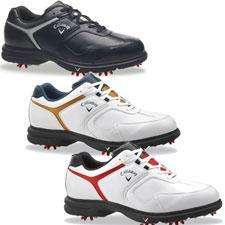 When buying golf shoes the choices nowadays seem endless. Some companies are putting out as many as 20 different lines of shoes in many different colors. Prices range from $20 to $2500 and sometimes you get what you pay for. As most of the readers know I have a love for golf shoes and when I first saw the Callaway Sport Era golf shoes I knew I had to grab a pair to review. I was always a Footjoy user until recently, when I reviewed the Nike Golf shoes. Since then I have realized that so many brands offer comfortable and stylish shoes that it opened my eyes to all different product lines. Oversized Big Bertha Spikes for Superior Traction – lightweight, dual-density construction gives the golfer increased durability, comfort and traction under most surface conditions . They are “different” looking than most of what is out there, and it is nice to say companies get away from the “same old shoe” look and try something a little more contemporary. The MSRP on these is $90.00, but from what we have seen they can be found at most places for around $70. So in that case, Callaway has managed to get both STYLISH & AFFORDABLE out of the way with passing marks. When it comes to comfort, these shoes were a little different. My foot feels great in them. No question about that. But my first time putting them on, it seems the tongue was kind of poking me in the leg a little bit. The tongue seems a little shorter, so it was awkward. To be fair though, after using them for less than a round, that discomfort went away. But if you have had issues like this in the past, make sure you try them on first. The shoes were very comfortable and the spikes are as good as we have seen. They grip the ground well and overall there was virtually no slipping while playing. So they clearly pass on the top three considerations, after the poking thing went away. The last thing I want to discuss is durability. We played with these shoes for about 3 weeks. We had no issues. Then it started. Most of the shoes I use have spikes that screw into the bottom of shoe and do not have any parts in between. These shoes have a piece of rubber under each spike that holds the spike and attaches to the shoe. You can see it in the picture above (gray section). On both pairs that we tried out the entire piece of rubber came off. And then more came off. In fact we each ended up losing about four different pieces. We spoke to Callaway about this and they said that the problem was with the adhesive and they sent us replacement pairs. Fabulous customer service the entire time. Since that first issue, the new shoes have had no problems at all. So for durability, it is a grade of “wait and see”. Overall we think that these shoes are worth the bargain price. They are stylish comfortable and fairly inexpensive compared to other lines out there. As long as we do not encounter any more issues with durability than these are here to stay. 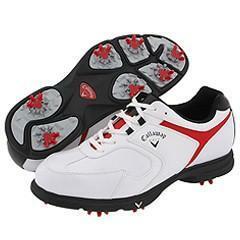 You can find them at most retailers that carry golf shoes or check them out at Shop Callaway. Good review, JB. As we talked about, I had the same feeling with the tongue, but am glad to hear that went away for you (I won’t be able to give it a good test for a LONG while). The rubber coming off is disconcerting, but can’t say surprising for a bargain shoe … and it was good to hear that Callaway’s customer support was as helpful as always. Great review again JB. I’m looking forward to trying on these shoes at the store. Hopefully they will find their way onto my feet. The rubber coming off doesn’t sound good but it is refreshing to know that Callaway is willing to fix their mistake. Goes right along with everything else I’ve heard about their Customer Service.